To receive a copy, just click on it or ask for it (e-mail: Francois.Bremond@sophia.inria.fr). Francois Bremond, Scene Understanding: perception, multi-sensor fusion, spatio-temporal reasoning and activity recognition, HDR Université de Nice-Sophia Antipolis, July 2007. Here you can get the english version and the defense presentation. Nicolas Chleq, Francois Bremond and Monique Thonnat, Image Understanding for Prevention of Vandalism in Metro Stations, in "The Kluwer International Series in Engineering and Computer Science" Serie "Advanced Video-Based Surveillance Systems", edited by Carlo S. Regazzoni, Gianni Fabri and Gianni Vernazza. Kluwer Academic Publishers. pp106-116. 1999. Frederic Cupillard, Francois Bremond and Monique Thonnat, Tracking Group of People for Video Surveillance, in "The Kluwer International Series in Computer Vision and Distributed Processing" Serie "Video-Based Surveillance Systems", edited by Paolo Remagnino,Graeme A. Jones, Nikos Paragios and Carlo S. Regazzoni. Kluwer Academic Publishers. pp89-100, 2002. Luis Patino, Francois Bremond and Monique Thonnat, Incremental learning on trajectory clustering, chapter in the book "Intelligent Paradigms in Safety and Security", edited by Paolo Remagnino, Publisher: Springer-Verlag, Germany. To be published 2011. Marcos Zuniga, Francois Bremond and Monique Thonnat, Uncertainty control for reliable video understanding on complex environments, chapter in the book "Video Surveillance", edited by InTech, ISBN 978-953-307-436-8 , Vienna Austria, February 2011. Guillaume Sacco and Francois Bremond, Les technologies de l'information pour limiter les effets de la Maladie d'Alzheimer, chapter in the book "Alzheimer, éthique et société", edited by Eres, supervised by Fabrice Gzil, Emmanuel Hirsch from Espace Ethique, September, 2012. B. Boulay, JF. Goudou and F. Bremond. Activity Recognition. chapter in the book "Intelligent Video Surveillance Systems", edited by Publisher: Wiley Online Library, DOI:10.1002/9781118577851.ch12, Online: 5 February 2013. L. Patino, H. Benhadda and F. Bremond. Data Mining in a Video Database. chapter in the book "Intelligent Video Surveillance Systems", edited by Publisher: Wiley Online Library, DOI:10.1002/9781118577851.ch14, Online: 5 February 2013. B. Boulay, JF. Goudou and F. Bremond. Qualification and Evaluation of Performances. chapter in the book "Intelligent Video Surveillance Systems", edited by Publisher: Wiley Online Library, DOI:10.1002/9781118577851.ch18, Online: 5 February 2013. S. Bak and F. Bremond. Re-identification by Covariance Descriptors. Chapter 3 in the book "Person Re-Identification", edited by S. Gong, M. Cristani, S. Yan, C.C. Loy, Publisher: Springer online e-Book, 2014, XVIII, 445 p. 163 illus., 154 illus. in color. Overall book website at Springer, ISBN: 978-1-4471-6295-7 (Print) 978-1-4471-6296-4 (Online), Online: 31 Jan 2014. C. Crispim, Q. Ma, B. Fosty, R. Romdhane, F. Bremond and M. Thonnat. Combining Multiple Sensors for Event Detection of Older People. Chapter 9 (Pages 179-194) in the book "Health Monitoring and Personalized Feedback Using Multimedia Data", edited by A. Briassouli, J. Benois-Pineau, A. Hauptmann, Publisher: Springer online amazon, (see flyer), 283 p., ISBN-10: 3319179624, ISBN-13: 978-3319179629, Online: July 14, 2015. Francois Bremond and Monique Thonnat, Issues of representing context illustrated by video-surveillance applications, in proceedings of the International Journal of Human-Computer Studies, Special Issue on Context, (1998) 48, 375-391. Francois Bremond and Monique Thonnat, Tracking multiple non-rigid objects in video sequences, in proceedings of the IEEE Transactions On Automatic Control, Vol. 8. No. 5, Sep 1998. G. Médioni, I. Cohen, F. Brémond, S. Hongeng et R. Nevatia. Event Detection and Analysis from Video Streams, in IEEE Transactions on Pattern Analysis and Machine Intelligence, Vol. 23. No. 8, pp. 873-889, Aug 01. T. Vu, F. Brémond and M. Thonnat. Human behaviour visualisation and simulation for automatic video understanding. Journal of WSCG, Volume 10, No.1-3, 2002, pp485-492, ISSN1213-6972. S. Hongeng, R. Nevatia and F. Bremond. Video-Based Event Recognition: Activity Representation and Probabilistic Recognition Methods. In Computer Vision and Image Understanding (CVIU), Volume 96, Issue 2, November 2004, Pages 129-162, Special Issue on Event Detection in Video 2004. Alberto Avanzi, Francois Bremond, Christophe Tornieri and Monique Thonnat, Design and Assessment of an Intelligent Activity Monitoring Platform, in EURASIP Journal on Applied Signal Processing, special issue in "Advances in Intelligent Vision Systems: Methods and Applications", 2005:14, pp.2359-2374. F. Brémond, M. Thonnat and M. Zuniga, Video Understanding Framework For Automatic Behavior Recognition. In Behavior Research Methods , 38(3), 416-426, 2006. B. Boulay, F. Brémond and M. Thonnat, Applying 3D Human Model in a Posture Recognition System. In Pattern Recognition Letter , Special Issue on vision for Crime Detection and Prevention,Vol.27, No15, pp. 1788-1796, Nov 2006. B. Georis, F. Brémond and M. Thonnat, Real-Time Control of Video Surveillance Systems with Program Supervision Techniques. In Machine Vision and Applications Journal , 18:189-205, Jan 2007. F. Fusier, V. Valentin, F. Brémond, M. Thonnat, M. Borg D. Thirde and J. Ferryman, Video Understanding for Complex Activity Recognition. In Machine Vision and Applications Journal , 18:167-188, Feb 2007. L. Patino,H. Benhadda, E. Corvee, F. Brémond and M. Thonnat, Extraction of activity patterns on large video recordings. In Computer Vision, IET, Volume 2, Issue 2, Page(s):108 - 128, June 2008. T. L Le, M. Thonnat, A. Boucher and F. Brémond, Surveillance video indexing and retrieval using objet features and semantic events. In IJPRAI special issue on Visual Analysis and Understanding for Surveillance Applications, 2009. N. Zouba, F. Bremond, M. Thonnat, A. Anfonso, E. Pascual, P. Mallea, V. Mailland and O. Guerin, A Computer system to monitor older adults at home: preliminary results - Old version - and A Computer system to monitor older adults at home: preliminary results - Official version. In the international journal Gerontechnology, SFTAG: Gerontechnology-French Issue, vol.8 no.3 July 2009. V. Martin, JM. Travere, V. Moncada, F. Bremond and G. Dunand, Thermal Event Recognition Applied to Protection of Tokamak Plasma Facing Components. In the IEEE Transactions on Instrumentation & Measurement, Volume: 59, Issue: 5, pp.1182-1191. Digital Object Identifier: 10.1109/TIM.2009.2038032, May 2010. N. Zouba, F. Bremond, A. Anfonso, M. Thonnat, E. Pascual, and O. Guerin, Monitoring elderly activities at home, Gerontechnology 9,2 - May 31, 2010. V. Martin, JM. Travere, V. Moncada, G. Dunand and F. Bremond, Towards Intelligent Video Understanding Applied to Plasma Facing Component Monitoring. In the IEEE Contributions to Plasma Physics, Wiley-VCH, DOI 10.1002/ctpp.201000054, CPP 51, No. 2-3/2011, page 252-255, March 2011. S. Sundaram, F. Bremond, M. Thonnat and H. J. Kim, Online Learning Neural Tracker In Neurocomputing Letters : NEUCOM-D-10-00545, ELSEVIER, Vol74, Issue10, ISSN 0925-2312, May 2011. S. Bak, E. Corvee, F. Bremond and M. Thonnat, Boosted human re-identification using Riemannian manifolds, Image and Vision Computing IMAVIS, doi:10.1016/j.imavis.2011.08.008 - 2011. M. Zuniga, F. Bremond and M. Thonnat, Real-time reliability measure-driven multi-hypothesis tracking using 2D and 3D features, EURASIP Journal on Advances in Signal Processing, 2011:142, doi:10.1186/1687-6180-2011-142 - 30 December 2011. G. Pusiol, F. Bremond and M. Thonnat, Unsupervised Discovery, Modeling, and Analysis of Long Term Activities, Computer Vision Systems - Lecture Notes , in Computer Science Volume 6962, pp 101-111, November 2011. M. Zuniga, F. Bremond and M. Thonnat, Hierarchical and Incremental Event Learning Approach based on Concept Formation Models, NEUROCOMPUTING, Special Issue: Behaviours in Video, NEUCOM-D-11-00346R1 2011. R. Romdhane, E. Mulin, A. Derreumeaux, N. Zouba, J. Piano, L. Lee, I. Leroi, P. Mallea, R. David, M. Thonnat, F. Bremond and P.H. Robert, Automatic Video Monitoring system for assessment of Alzheimer's Disease symptoms, JNHA - The Journal of Nutrition, Health and Aging no3, vol16, 2012. M. Kaaniche and F. Bremond. Recognizing Gestures by Learning Local Motion Signatures of HOG Descriptors, TPAMI, Transactions on Pattern Analysis and Machine Intelligence, TPAMI-2010-06-0481.R2, Volume: 34 , Issue: 11, Page(s): 2247 - 2258, Nov. 2012. C. Crispim, V. Joumier, Y-L Hsu, M-C Pai, P-C Chung, A. Dechamps, P.H. 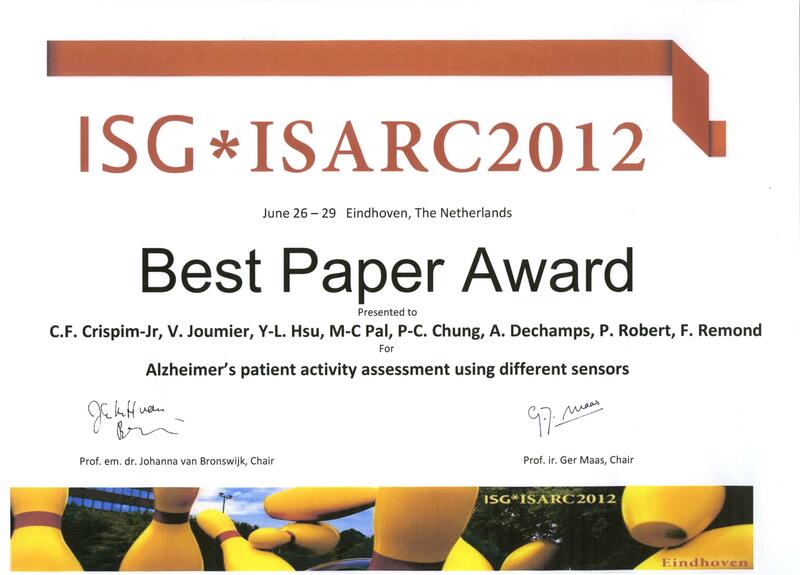 Robert and F. Bremond Alzheimer's patient activity assessment using different sensors, Gerontechnology 2012; 11(2):266-267; 2012, Best Paper Award of ISG*ISARC2012. G. Sacco, V. Joumier, N. Darmon, A. Dechamps, A. Derreumeaux, L. Lee, J. Piano, N. Bordone, A. Konig, B. Teboul, R. David, O. Guerin, F. Bremond and P.H. Robert, Detection of activities of daily living impairment in Alzheimer's disease and mild cognitive impairment using information and communication technology, Clinical Interventions in Aging Volume 2012:7 Pages 539 - 549 DOI: http://dx.doi.org/10.2147/CIA.S36297, Link to PubMed, December 2012. P. Robert, E.Castelli, P.C. Chung, T.Chiroux, C.F Crispim-Junior, P.Mallea and F. Bremond, SWEET HOME ICT technologies for the assessment of elderly subjects, IRBM BioMedical Engineering and Research Ref. No. : IRBM-D-13-00003, 2013. S. Bak and F. Bremond, Re-identification tool, ERCIM News, (95), Special theme: "Image Understanding", Guest editors: Michal Haindl, Institute of Information Theory and Automation, Academy of Sciences of the Czech Republic, and Josef Kittler, University of Surrey, UK - October 2013. P.H. Robert, A. Konig, S. Andrieu, F. Bremond, I. Chemin, P.C. Chung, J.F. Dartigues , B. Dubois, G. Feutren, R. Guillemaud, P.A. Kenisberg, S. Nave, B. Vellas, F. Verhey, J. Yesavage and P. Mallea. Recommendations for ICT use in Alzheimer's Disease assessment: Monaco CTAD expert meeting, JNHA - The Journal of Nutrition, Health and Aging n°8, vol 17, Ref. No. : JNHA-D-13-00016R1, 2013. F. Porikli, F. Bremond, S. L. Dockstader, J. Ferryman, A. Hoogs, B. C. Lovell, S. Pankanti, B. Rinner, P. Tu, and P. L. Venetianer. Video Surveillance: Past, Present, and Now the Future, IEEE Signal Processing Magazine forum, IEEE-SPM forum, 30 (3). pp. 190-198. ISSN 1053-5888 (In Press), DOI 10.1109/MSP.2013.2241312, May 2013. P.H. Robert, A. König, H. Amieva, S. Andrieu, F. Bremond, R. Bullock, M. Ceccaldi, B. Dubois, S. Gauthier, P-A. Kenigsberg, S. Nave, J-M. Orgogozo, J. Piano, M. Benoit, J. Touchon, B. Vellas, J. Yesavage, V. Manera. Recommendations for the use of Serious Games in people with Alzheimer~s Disease, related disorders and frailty, - Frontiers in AGING NEUROSCIENCE - METHODS ARTICLE doi: 10.3389/fnagi.2014.00054 published: 24 March 2014. P.D. Chau, M. Thonnat, F. Bremond and E. Corvee, Online Parameter Tuning for Object Tracking Algorithms, Image and Vision Computing Ref. No. : IMAVIS-D-12-00555R2, volume 32, issue 4, pages 287~302, April 2014. F. Bremond, V. Bogorny, L. Patino, S. Cosar, G. Pusiol and G. Donatiello, Monitoring People's Behaviour using Video Analysis and Trajectory Clustering, ERCIM News, (98), Special theme: "Smart Cities", Guest editors: Ioannis Askoxylakis, ICS-FORTH, Greece and Theo Tryfonas, Faculty of Engineering, University of Bristol, UK - July 2014. S. Elloumi, S. Cosar, G. Pusiol, F. Bremond and M. Thonnat. Unsupervised Discovery of Human Activities from Long-Videos, IET Computer Vision, CVI-2014-0311.R1, 2014. A. König, C. Crispim, A. Derreumaux, G. Bensadoum, P.D. Petit, F. Bremond, R. David, F. Verhey, P. Aalten and P.H. Robert. Validation of an Automatic Video Monitoring System for the Detection of Instrumental Activities of Daily Living in Dementia Patients, - Journal of Alzheimer Disease, - 44 (2015) pp. 675~685, IOS Press, DOI 10.3233/JAD-141767, 2015. PA. Kenigsberg, JP. Aquino, A. Berard, F. Gzil, S. Andrieu, S. Banerjee, F. Bremond, L. Buee, J. Cohen-Mansfield, F. Mangialasche, H. Platel, E. Salmon and P. Robert. Dementia beyond 2025: knowledge and uncertainties, - Dementia: the international journal of social research and practice - published online on March 3, 2015 and printed as an editorial in the November 2015 issue. A. König, C. Crispim, A. Covella, F. Bremond, A. Derreumaux, G. Bensadoum, R. David, F. Verhey, P. Aalten and P.H. Robert. Ecological Assessment of Autonomy in Instrumental Activities of Daily Living in Dementia Patients by the means of an Automatic Video Monitoring System, Frontiers in Aging Neuroscience - open access publication and the eBook - http://dx.doi.org/10.3389/fnagi.2015.00098, 02 June 2015. A. König, G. Sacco, G. Bensadoum, F. Bremond, R. David, F. Verhey, P. Aalten, P.H. Robert and V. Manera. The role of Information and Communication Technologies in clinical trials with patients with Alzheimer's disease and related disorders, Frontiers in Aging Neuroscience - open access publication - http://dx.doi.org/10.3389/fnagi.2015.00110, 09 June 2015. M. Tsolaki, A. König, C. Crispim, F. Bremond, A. Karakosta and P.H. Robert, Functional assessment of patients with dementia and mild cognitive impairment with the help of a multiple sensor system, Alzheimer's & Dementia, doi:10.1016/j.jalz.2015.07.108, ELSEVIER, Volume 11, Issue 7, Supplement, Pages P164, July 2015. S. Bak and F. Bremond, Person re-identification employing 3D scene information, Journal of Electronic Imaging Letters, Special theme: "PANORAMA: Ultra Wide, Context- and Content-Aware Imaging", Guest editors: Vol. 24, No 5, ISSN 1017-9909, p. 051007, September/October issue 2015. S. Bak, M. Biagio, R. Kumar, V. Murino and F. Bremond, Exploiting Feature Correlations by Brownian Statistics for People Detection and Recognition, IEEE Transactions on Systems, Man and Cybernetics: Systems, IEEET-SMC 2016. C. Crispim-Junior, K. Avgerinakis, V. Buso, G. Meditskos, A. Briassouli, J. Benois-Pineau, Y. Kompatsiaris and F. Bremond. Semantic Event Fusion of Different Visual Modality Concepts for Activity Recognition, Transactions on Pattern Analysis and Machine Intelligence - PAMI 2016. K.N. Dhandapani and F. Bremond. Globality-Locality Based Consistent Discriminant Feature Ensemble for Multicamera Tracking, In the IEEE Transactions on Circuits and Systems for Video Technology - TCSVT 10628 - 2016. B. Fosty, G. Ben-Sadoun, G. Sacco, A. Konig, V. Manera, P. Foulon, J. Brisswalter, P. Robert and F. Bremond. Accuracy and reliability of the RGB-D camera for measuring walking speed on a treadmill, Gait & Posture, 48 (2016) 113-119, 2016. S. Cosar, G. Donatiello, V. Bogorny, C. Garate, L.O. Alvares and F. Bremond. Towards Abnormal Trajectory and Event Detection in Video Surveillance, in the special issue on Group and Crowd Behavior Analysis for Intelligent Multi-camera Video Surveillance of the IEEE Transactions on Circuits and Systems for Video Technology to appear, 2016. A. Dantcheva, P. Bilinski, J.C. Broutart, P. Robert and F. Bremond. Emotion facial recognition by the means of automatic video analysis, in the Gerontechnology journal Vol 15 (suppl): 12s doi: http://dx.doi.org/10.4017/gt.2016.15.s.939.00, 2016. B. Fosty and F. Bremond. Visual recognition of gait parameters, in the Gerontechnology journal Vol 15 (suppl): 109s doi: http://dx.doi.org/10.4017/gt.2016.15.s.837.00, 2016. C. Crispim-Junior, A. Koenig, R. David, P. Robert and F. Bremond. Automatic prediction of autonomy in activities of daily living of older adults, in the Gerontechnology journal Vol 15 (suppl): 12s doi:10.4017/gt.2016.15.s.875.00, 2016. F. Negin, J. Bourgeois, E. Chapoulie, P. Robert and F. Bremond. Praxis and Gesture Recognition, in the Gerontechnology journal Vol 15 (suppl): 12s doi:10.4017/gt.2016.15.s.875.00, 2016. M.K. Phan Tran, P. Robert and F. Bremond. An assistive system to improve game usabil-ity for patients with cognitive, in the Gerontechnology journal Vol 15 (suppl): 157s doi: http://dx.doi.org/10.4017/gt.2016.15.s.758.00, 2016. A. Gros, R. David, P-C. Chung, L. Chicheportiche, L. Moy, J. De Stoutz, S. Guetin, F. Bremond and P. Robert. First results from the SafEE project: Safe & Easy Environment for Alzheimer's, in the Gerontechnology journal Vol 15 (suppl): 80s doi: http://dx.doi.org/10.4017/gt.2016.15.s.789.00, 2016. A. Dantcheva and F. Bremond. Gender estimation based on smile-dynamics, in the IEEE Transactions on Information Forensics & Security T-IFS-06012-2016.R2, 2016. G. Ben-Sadoun, G. Sacco, V. Manera, J. Bourgeois, A. Konig, P. Foulon, B. Fosty, F. Bremond, F. d'Arripe-Longueville and P. Robert Physical and Cognitive Stimulation Using an Exergame in Subjects with Normal Aging, Mild and Moderate Cognitive Impairment, in the Journal of Alzheimer's Disease 53 (2016) 1299~1314 DOI 10.3233/JAD-160268 IOS Press, 2016. PA. Kenigsberg, JP. Aquino, A. Berard, F. Bremond, K. Charras, T. Dening, RM Droes, F. Gzil, B. Hicks A. Innes, M. Nguyen, L. Nygard, M. Pino, G. Sacco, E. Salmon, H. Van Der Roest, H. Villet, M. Villez, P. Robert and V. Manera. Assistive technologies to address capabilities of people with dementia: from research to practice, - Dementia: the international journal of social research and practice - to be published online, 2017. C. Crispim-Junior, A. Gomez-Uria, C. Strumia, M. Kopersky, A. Konig, F. Negin, S. Cosar, A.T. Nghiem, G. Charpiat, F. Bremond and P. Chau. Online recognition of daily activities by color-depth sensing and knowledge models, Sensors 17, MDPI, 17 (7), p. 1-15, 7, June 2017. V. Manera, G. Ben-Sadoun, T. Aalbers, H. Agopyan, F. Askenazy, M. Benoit, D. Bensamoun, J. Bourgeois, J. Bredin, F. Bremond, C. CRISPIM-JUNIOR, R. David, B. De Schutter, E. Ettore, J. Fairchild, P. Foulon, A. Gazzaley, A. Gros, S. Hun, F. Knoefel, M. Olde Rikkert, M.K. Phan Tran, A. Politis, A. Sophie Rigaud, G. Sacco, S. Serret, S. Thümmler, M.L. Welter and P. Robert. Recommendations for the use of Serious Games in neurodegenerative disorders: 2016 Delphi panel, Frontiers in in Psychology, section Human-Media Interaction - open access publication, July 2017. R. Trichet and F. Bremond. Dataset Optimization for Real-Time Pedestrian Detection, in the IEEE Access Journal, p.1-9, Online ISSN: 2169-3536, DOI: 10.1109/ACCESS.2017.2788058, 15 Dec 2017. F. Negin, J. Bourgeois, P. Robert and F. Bremond. A Gesture Recognition Framework for Cognitive Assessment, in the Gerontechnology journal, Vol. 7, suppl., 169s, https://doi.org/10.4017/gt.2018.17.s.164.00, April 2018. F. Negin, P. Rodriguez, M. Koperski, A. Kerboua, J. Gonzalez, J. Bourgeois, E. Chapoulie, P. Robert and F. Bremond. PRAXIS: Towards Automatic Cognitive Assessment Using Gesture Recognition, in the Expert Systems With Applications journal, https://doi.org/10.1016/j.eswa.2018.03.063, ESWA-D-17-04080R1, Volume 106, Pages 21-35, 15 September 2018. P.Robert, K. L. Lanctot, L. Agüera-Ortiz, P. Aalten, F. Bremond, M. Defrancesco, C. Hanon, R. David, B. Dubois, K. Dujardin, M. Husain, A. König, R. Levy, V. Mantua, D. Meulien, D. Miller, H.J. Moebius, J. Rasmussen, G. Robert, M. Ruthirakuhan, F. Stella, J. Yesavage, R. Zeghari, V. Manera. Is it time to revise the diagnostic criteria for apathy in brain disorders? the 2018 international consensus group, in the European Psychiatry journal, to appear, 2018. R. Trichet and F. Bremond. How to train your dragon: best practices in pedestrian classifier training, in the IEEE Access Journal, Online ISSN: 2169-3536, DOI: 10.1109/ACCESS.2019.2891950, Jan 2019. F. Brémond and M. Thonnat. A context representation for surveillance systems . In proc. of the Workshop on Conceptual Descriptions from Images at the European	Conference on Computer Vision (ECCV), Cambridge (UK), April 1996. J.C. Ossola, F. Brémond and M. Thonnat. A Communication Level in a Distributed Architecture for Object Recognition . In proc. of the 8th International Conference on Systems Research Informatics and Cybernetics (Intersymp'96) - Baden-Baden (Germany), 14/18 August 1996. F. Brémond and M. Thonnat. Issues in representing context illustrated by scene interpretation applications . In proc. of the International and Interdisciplinary Conference on Modeling and Using Context (CONTEXT-97), Rio de Janeiro (Brasil), February 1997. F. Brémond and M. Thonnat. Analysis of human activities described by image sequences . In proc. of the 10th International FLAIRS Conference , Florida (USA), May 1997. F. Brémond and M. Thonnat. Comments on issues in action recognition . For the NSF and DARPA Workshop on Perception of Action in Computer Vision , Cape Cod MS (USA), May 1997. F. Brémond and M. Thonnat. Tracking multiple non-rigid objects in a cluttered scene . In proc. of the 10th Scandinavian Conference on Image Analysis (SCIA) , Lappeenranta (Finland), June 1997. F. Brémond and M. Thonnat. Recognition of scenarios describing human activities . In proc. of the International Workshop on Dynamic Scene Recognition from Sensor Data , Toulouse (France), June 1997. F. Brémond and M. Thonnat. Object tracking and scenario recognition for video-surveillance . In the poster sessions of the 15th International Joint Conference on Artificial Intelligence (IJCAI), Nagoya (Japan), August 1997. Francois Bremond and Gerard Medioni, Scenario Recognition in Airborne Video Imagery, Interpretation of Visual Motion Workshop, Computer Vision and Pattern Recognition CVPR98, Santa Barbara, June 1998. Somboon Hongeng and Francois Bremond and Ram Nevatia, Representation and Optimal Recognition of Human Activities, Proc. of the IEEE Conference on Computer Vision and Pattern Recognition CVPR00, South Carolina, June 2000. Somboon Hongeng and Francois Bremond and Ram Nevatia, Bayesian Framework for Video Surveillance Application, Proc. of the 15th International Conference on Pattern Recognition ICPR00, Barcelona, September 2000. Gerard Medioni, Isaac Cohen, Francois Bremond, Somboon Hongeng and Ram Nevatia, Event Detection and Analysis from Video Streams, In IEEE Transactions on Pattern Analysis and Machine Intelligence PAMI, Vol. 23. No.8, pp. 873-889, Aug 01. F. Cupillard, F. Brémond and M. Thonnat, Tracking Group of People for Video Surveillance, In IEEE Proc. of the 2nd European Workshop on Advanced Video-Based Surveillance System - AVBS2002, University of Kingston (London) UK, Sep 2001. A. Avanzi, F. Brémond and M. Thonnat, Tracking Multiple Individuals for Video Communication, In IEEE Proc. of International Conference on Image Processing, Thessaloniki (Greece), October 2001. T. Vu, F. Brémond and M. Thonnat, Human behaviour visualisation and simulation for automatic video understanding, The 10-th International Conference in Central Europe on Computer Graphics, Visualization and Computer Vision'2002 (WSCG'2002), pp485-492 (ISSN1213-6972, Vol.10, No.2, 2002), Czech Republic, February 4 - 8, 2002. T. Vu, F. Brémond and M. Thonnat, Temporal Constraints for Video Interpretation, The 15-th European Conference on Artificial Intelligence ECAI'2002, W9: Modelling and Solving Problems with Constraints, Lyon, France, 21-26 July 2002. T. Vu, F. Brémond and M. Thonnat, Video surveillance: human behaviour representation and on-line recognition, The Sixth International Conference on Knowledge-Based Intelligent Information & Engineering Systems (KES'2002), Podere d'Ombriano Crema Italy, 16, 17 & 18 September 2002. F. Cupillard, F. Brémond and M. Thonnat, Group Behavior Recognition With Multiple Cameras, In IEEE Proc. of the Workshop on Applications of Computer Vision - ACV2002, Orlando USA, Dec 3,4 2002. F. Cupillard, F. Brémond and M. Thonnat, Behaviour Recognition for Individuals, Groups of people and Crowd, In IEE Proc. of the IDSS Symposium - Intelligent Distributed Surveillance Systems, London, UK, 26 February 2003. C. Tornieri, F. Brémond and M. Thonnat, Reference Image for a Visual Surveillance Platform, In IEE Proc. of the IDSS Symposium - Intelligent Distributed Surveillance Systems, London, UK, 26 February 2003. T. Vu, F. Brémond and M. Thonnat, Automatic Video Interpretation: A Recognition Algorithm for Temporal Scenarios Based on Pre-compiled Scenario Models, The 3rd International Conference on Computer Vision Systems - ICVS 2003, Graz, Austria, April 2003. N. Moënne-Loccoz, F. Brémond and M. Thonnat, Recurrent Bayesian Network for the Recognition of Human Behaviors from Video, The 3rd International Conference on Computer Vision Systems - ICVS 2003, Graz, Austria, April 2003. T. Vu, F. Brémond and M. Thonnat, Automatic Video Interpretation: A Novel Algorithm for Temporal Scenario Recognition. The Eighteenth International Joint Conference on Artificial Intelligence (IJCAI'03), Acapulco, Mexico, 9-15 August 2003. B. Boulay, F. Brémond and M. Thonnat, Human Posture Recognition in Video Sequence. The Joint IEEE International Workshop on Visual Surveillance and Performance Evaluation of Tracking and Surveillance (VS-PETS), Nice, France on October 11-12 2003. B. Georis, F. Brémond, M. Thonnat and B. Macq, Use of an Evaluation and Diagnosis Method to Improve Tracking Performances . The 3rd IASTED International Conference on Visualization, Imaging and Image Proceeding VIIP 03 , September 8-10 2003, Benalmadera, Spain. B. Georis, M. Mazière, F. Brémond and M. Thonnat, A Video Interpretation Platform Applied to Bank Agency Monitoring. The Intelligent Distributed Surveillance Systems Workshop, London, UK, February 23th, 2004. F. Cupillard, A. Avanzi, F. Brémond and M. Thonnat, Video Understanding for Metro Surveillance. The IEEE ICNSC 2004 in the special session on Intelligent Transportation Systems, Taiwan, March 2004. J. Bannour, B. Georis, F. Brémond and M. Thonnat, Generation of 3D Animations from Scenario Models. The IASTED 4rd International Conference on Visualization, Imaging and Image Processing, Marbella, Spain, September 6-8th, 2004. M. Borg, D. Thirde, J. Ferryman, F. Fusier, F. Brémond and M. Thonnat, An Integrated Vision System for Aircraft Activity Monitoring. The IEEE PETS2005 workshop in Breckenridge, Colorado, on January 7 2005. F. Cupillard, F. Brémond and M. Thonnat, Automatic Visual Recognition for Metro Surveillance. At Measuring Behavior 2005, Wageningen The Netherlands, on September 1-2 2005. M. Borg, D. Thirde, J. Ferryman, F. Fusier, V. Valentin, F. Brémond and M. Thonnat, Video Event Recognition for Aircraft Activity Monitoring. The 8th International IEEE Conference on Intelligent Transportation Systems (ITSC´05), in Vienna, Austria on the 13th to 16th of September 2005. B. Bui, F. Brémond, M. Thonnat and JC. Faure, "Shape Recognition Based on a Video and Multi-Sensor System". The IEEE International Conference on Advanced Video and Signal-Based Surveillance (AVSS 2005), Como, Italie, on September 15-16, 2005. D. Thirde, M. Borg, J. Ferryman, F. Fusier, V. Valentin, F. Brémond and M. Thonnat, "Video Event Recognition for Aircraft Activity Monitoring". The IEEE International Conference on Advanced Video and Signal-Based Surveillance (AVSS 2005), Como, Italie, on September 15-16, 2005. M. Borg, D. Thirde, J. Ferryman, F. Fusier, V. Valentin, F. Brémond and M. Thonnat and J. Aguilera and M. Kampel, "Visual Surveillance for Aircraft Activity Monitoring". The Proceedings of the Second Joint IEEE International Workshop on Visual Surveillance and Performance Evaluation of Tracking and Surveillance, Beijing, China, 15-16th October 2005. J. Ferryman, M. Borg, D. Thirde, F. Fusier, V. Valentin, F. Brémond and M. Thonnat and J. Aguilera and M. Kampel, "Automated Scene Understanding for Airport Aprons". The Proceedings of 18th Australian Joint Conference on Artificial Intelligence, Sidney, Australia, 5-9 December 2005. A. Toshev, F. Brémond and M. Thonnat, "An A priori-based Method for Frequent Composite Event Discovery in Videos". The Proceedings of 2006 IEEE International Conference on Computer Vision Systems, New York, USA, January 5-7, 2006. B. Georis, F. Brémond and M. Thonnat, "Evaluation and Knowledge Representation Formalisms to Improve Video Understanding". The Proceedings of 2006 IEEE International Conference on Computer Vision Systems, New York, USA, January 5-7, 2006. M. Borg, D. Thirde, J. Ferryman, F. Fusier, V. Valentin, F. Brémond and M. Thonnat, "A Real-Time Scene Understanding System for Airport Apron Monitoring". The Proceedings of 2006 IEEE International Conference on Computer Vision Systems, New York, USA, January 5-7, 2006. MB.Kaâniche, F. Brémond and M. Thonnat, Monitoring Trichogramma Activities from Videos : An adaptation of cognitive vision system to biology field. The International Cognitive Vision Workshop, (ICVW'2006) in conjunction with the 9th European Conference on Cognitive Vision (ECCV'2006), Graz, Austria, May 07-13, 2006. T. Vu, F. Brémond, G. Davini, M. Thonnat, Q.C. Pham, N. Allezard, P. Sayd, J.L. Rouas, S. Ambellouis and A. Flancquart, Audio Video Event Recognition System for Public Transport Security. The IET conference on Imaging for Crime Detection and Prevention (ICDP 2006),pp.414-419, London, Great Britain, June 13-14, 2006. C. Carincotte, X. Desurmont, B. Ravera, F. Bremond, J. Orwell, S.A. Velastin, J.M. Odobez, B. Corbucci, J. Palo, J. Cernocky, Toward generic intelligent knowledge extraction from video and audio: the EU-funded CARETAKER project. The IET conference on Imaging for Crime Detection and Prevention (ICDP 2006), pp470-476, London, Great Britain, June 13-14, 2006. M. Zúñiga, F. Brémond and M. Thonnat, Fast and reliable object classification in video based on a 3D generic model. The 3rd International Conference on Visual Information Engineering (VIE 2006), pp.433-440, Bangalore, India, September 26-28, 2006. B. Zhan, P. Remagnino, S. Velastin, F. Brémond and M. Thonnat, Matching gradient descriptors with topological constraints to characterise the crowd dynamics . The 3rd International Conference on Visual Information Engineering (VIE 2006), pp.441-440, Bangalore, India, September 26-28, 2006. A.T Nghiem F. Bremond M. Thonnat and R. Ma. New Evaluation Approach for Video Processing Algorithms. In the WMVC 2007 IEEE Workshop on Motion and Video Computing - Austin - Texas - USA, February 23-24, 2007. Nadia Zouba, François Bremond, Monique Thonnat and Van Thinh Vu. Multi-sensors Analysis for Everyday Elderly Activity Monitoring. In the SETIT 2007, 4th International Conference: Sciences of Electronic, Technologies of Information and Telecommunications - Tunis, TUNISIA, March 25-29, 2007. J.L Patino, H. Benhaddha, E. Corvee, F. Bremond and M. Thonnat. Video-Data Knowledge Modelling and Discovery. In the 4th International Conference on Visual Information Engineering (VIE 2007), London - UK, July 26-27, 2007. A.T Nghiem F. Bremond M. Thonnat and V. Valentin. ETISEO, an evaluation project for video surveillance systems. In the AVSS 2007, IEEE International Conference on Advanced Video and Signal based Surveillance, London - UK, September 5-7, 2007. J.L Patino, E. Corvee, F. Bremond and M. Thonnat. Management of Large Video Recordings. In the AmI.d 2007 Ambient Intelligence Developments, Sophia Antipolis - France, September 17-19, 2007. H. Benhaddha, J.L Patino, E. Corvee, F. Bremond and M. Thonnat. Data Mining on large Video Recordings. In the VSST 2007 Veille Strategique Scientifique & Technologique, Marrakech - Maroc, October 21-25, 2007. C. Marchessoux, X.Desurmont, F. Brémond, D. Makris, S. Boughorbel, R. Koeleman, W. Favoreel, C. Machy and E. Jaspers. Performance evaluation of multi media analysis for surveillance applications. Bristish Machine Vision Association symposium on Security and surveillance: performance evaluation, London - UK, December 12, 2007. F. Bremond and A.T Nghiem. ETISEO Performance Evaluation for Video Surveillance Systems. Bristish Machine Vision Association symposium on Security and surveillance: performance evaluation, London - UK, December 12, 2007. T. L Le, M. Thonnat, A. Boucher and F. Bremond. A Query Language Combining Object Features and Semantic Events. The 14th International MultiMedia Modeling Conference (MMM'2008), Kyoto - Japan, January 9-11, 2008. T. Räty, L. Lehikoinene and F. Bremond. Scalable Video Transmission for a Surveillance System. In the 5th International Conference on Information Technology : New Generations (ITNG 2008), Las Vegas, Nevada, USA, April 7-9, 2008. N. Zouba, F. Bremond and M. Thonnat. Monitoring Activities of Daily Living (ADLs) of Elderly Based on 3D Key Human Postures. In the 4th International Cognitive Vision Workshop, ICVW 2008 - Santorini, Greece, May 12-15, 2008. T. L Le, A. Boucher, M. Thonnat and F. Bremond. A Framework for Surveillance Video Indexing and Retrieval. The 6th International Workshop on Content Based Multimedia Indexing, CBMI'08, London, UK, 17-20 June 2008. A.T.Nghiem, F. Bremond, and M. Thonnat. Shadow removal in indoor scenes. The 5th IEEE International Conference On Advanced Video and Signal Based Surveillance (AVSS 08), Santa Fe, USA, September 1-3, 2008. G. Pusiol, J. L. Patino, F. Bremond, M. Thonnat, and S. Suresh. Optimizing Trajectories Clustering for Activity Recognition. The 1st International Workshop on Machine Learning for Vision-based Motion Analysis (MLVMA 08), Marseille, France, October 12-18, 2008. S. Saxena, F. Bremond, M. Thonnat and R. Ma. Crowd Behavior Recognition for Video Surveillance. The Advanced Concepts for Intelligent Vision Systems (ACIVS 08), Juan-les-Pins, France, October 20-24, 2008. S. Bak, S. Sundaram, F. Bremond and M. Thonnat. Fusion of Motion Segmentation with Online Adaptive Neural Classifier for Robust Tracking. In the International Conference on Computer Vision Theory and Applications (VISAPP 09), Lisboa, Portugal, February 5-8, 2009. D.P. Chau, F. Bremond, E. Corvee and M. Thonnat. Repairing People Trajectories Based on Point Clustering. In the International Conference on Computer Vision Theory and Applications (VISAPP 09), Lisboa, Portugal, February 5-8, 2009. V. Martin, F. Bremond, J.M. Travere, V. Moncada and Gwenael Dunand. Thermal Event Recognition Applied to Tokamak Protection during Plasma Operation. In the IEEE International Instrumentation and Measurement Technology Conference (I2MTC 2009), Singapore, May 5-7, 2009. M. Siala, N. Khlifa, F. Bremond, and K. Hamrouni. People detection in complex scene using a cascade of Boosted classifiers based on Haar-like-features. In the IEEE Intelligent Vehicle Symposium (IEEE IV 2009), Xi'an, Shaanxi, China, Jun 3-5, 2009. N. Zouba, F. Bremond and M. Thonnat. Multisensor Fusion for Monitoring Elderly Activities at Home. The 6th IEEE International Conference On Advanced Video and Signal Based Surveillance (AVSS 09), Genoa, Italy, September 2-4, 2009. M. Kaaniche and F. Bremond. Tracking HoG Descriptors for Gesture Recognition. The 6th IEEE International Conference On Advanced Video and Signal Based Surveillance (AVSS 09), Genoa, Italy, September 2-4, 2009. C. Carincotte, F. Bremond, J.-M. Odobez, L. Patino, B. Ravera and X. Desurmont. Multimedia Knowledge-Based Content Analysis over Distributed Architecture. The Networked and Electronic Media, 2009 NEM Summit - "Towards Future Media Internet", Saint-Malo, 28-30 September 2009. G. Pusiol, F. Bremond and M. Thonnat. Trajectory based Primitive Events for learning and recognizing Activity. The Second IEEE International Workshop on Tracking Humans for the Evaluation of their Motion in Image Sequences (THEMIS2009) in conjunction with ICCV2009, Kyoto, Japan, October 3rd 2009. M. Zúñiga, F. Brémond and M. Thonnat, "Incremental Video Event Learning". The Proceedings of the 7th IEEE International Conference on Computer Vision Systems, Liege, Belgium, October 13-15, 2009. E. Corvee and F. Brémond, "Combining face detection and people tracking in video surveillance". The Proceedings of the 3rd International Conference on Imaging for Crime Detection and Prevention, ICDP 09, Kingston University, London, UK, 3rd December 2009. D.P. Chau, F. Brémond and M. Thonnat, "Online evaluation of tracking algorithm performance". The Proceedings of the 3rd International Conference on Imaging for Crime Detection and Prevention, ICDP 09, Kingston University, London, UK, 3rd December 2009. A.T. Nghiem, F. Brémond and M. Thonnat, "Controlling Background Subtraction Algorithms for Robust Object Detection". The Proceedings of the 3rd International Conference on Imaging for Crime Detection and Prevention, ICDP 09, Kingston University, London, UK, 3rd December 2009. R. Romdhane, F. Brémond and M. Thonnat, "Handling Uncertainty for Video Event Recognition". The Proceedings of the 3rd International Conference on Imaging for Crime Detection and Prevention, ICDP 09, Kingston University, London, UK, 3rd December 2009. P. Bilinski, F. Brémond and M. Kaaniche, "Multiple object tracking with occlusions using HOG descriptors and multi resolution images". The Proceedings of the 3rd International Conference on Imaging for Crime Detection and Prevention, ICDP 09, Kingston University, London, UK, 3rd December 2009. C. Garate, P. Bilinski and F. Brémond, "Crowd Event Recognition Using HOG Tracker". In the Proceedings of the Twelfth IEEE International Workshop on Performance Evaluation of Tracking and Surveillance, (invited paper), Winter-PETS 2009. Snowbird, Utah - 9th December 2009. N. Zouba, F. Bremond, A. Anfonso, M. Thonnat, E. Pascual, and O. Guerin. Monitoring elderly activities at home. Abstract for the ISG 2010 Conference (International Society for Gerontechnology, the 7th world conference), Vancouver, Canada, 27 to 30 May 2010. MB.Kaaniche and F. Brémond, Gesture Recognition by Learning Local Motion Signatures. The Proceedings of the 23rd IEEE Conference on Computer Vision and Pattern Recognition, (CVPR'2010) San Francisco, 13-18 June, 2010. L. Patino, F. Brémond and M. Thonnat, Activity Discovery from Video employing Soft Computing Relations. In the IEEE International Joint Conference on Neural Networks and Computational Intelligence (IJCNN 2010), Barcelona, Spain, 19-23 July, 2010. I. Bechar, S. Moisan, M. Thonnat and F. Brémond, On-line video recognition and counting of harmful insects. In the International Conference for Pattern Recognition (ICPR 2010), Istanbul, Turkey, 23-26 August, 2010. T. L. Le, A. Boucher, M. Thonnat and F. Bremond. Surveillance video retrieval: what we have already done?. The Third International Conference on Communications and Electronics (ICCE 2010), Nha Trang, Vietnam, 11 - 13 August 2010. S. Bak, F. Bremond and M. Thonnat. Person Re-identification Using Haar-based and DCD-based Signature. In the 2nd Workshop on Activity Monitoring by Multi-Camera Surveillance Systems, AMMCSS 2010, in conjunction with 7th IEEE International Conference on Advanced Video and Signal-Based Surveillance, AVSS 2010, Boston, 29 August 2010. X. Desurmont, C. Carincotte and F. Bremond. Video Surveillance Systems: a Review of Performance Evaluation Metrics that use Mapping Procedures. In the Performance Evaluation of Tracking and Surveillance PETS 2010 Workshop, in conjunction with 7th IEEE International Conference on Advanced Video and Signal-Based Surveillance, AVSS 2010, Boston, 29 August 2010. S. Bak, E. Corvee, F. Bremond and M. Thonnat. Person Re-identification Using Spatial Covariance Regions of Human Body Parts. In the 7th IEEE International Conference on Advanced Video and Signal-Based Surveillance, AVSS 2010, Boston, 29 August 2010. N. Zouba, F. Bremond and M. Thonnat. An Activity Monitoring System for Real Elderly at Home: Validation Study. In the 7th IEEE International Conference on Advanced Video and Signal-Based Surveillance, AVSS 2010, Boston, 29 August 2010. R. Romdhane, F. Bremond and M. Thonnat. Complex Event Recognition with Uncertainty Handling. In the 7th IEEE International Conference on Advanced Video and Signal-Based Surveillance, AVSS 2010, Boston, 29 August 2010. E. Corvee and F. Bremond. Body parts detection for people tracking using trees of Histogram of Oriented Gradient descriptors. In the 7th IEEE International Conference on Advanced Video and Signal-Based Surveillance, AVSS 2010, Boston, 29 August 2010. G. Pusiol, F. Bremond and M. Thonnat. Trajectory Based Activity Discovery. In the 7th IEEE International Conference on Advanced Video and Signal-Based Surveillance, AVSS 2010, Boston, 29 August 2010. L. Patino, F. Bremond, M. Evans, A. Shahrokni and J. Ferryman. Video Activity Extraction and Reporting with Incremental Unsupervised Learning. In the 7th IEEE International Conference on Advanced Video and Signal-Based Surveillance, AVSS 2010, Boston, 29 August 2010. D.P. Chau, F. Bremond, M. Thonnat and E. Corvee. Robust mobile object tracking based on multiple feature similarity and trajectory filtering. In the International Conference on Computer Vision Theory and Applications (VISAPP), Algarve, Portugal, 5-7 March, 2011. S. Bak, E. Corvee, F. Bremond and M. Thonnat. Multiple-shot Human Re-Identification by Mean Riemannian Covariance Grid. In the 8th IEEE International Conference on Advanced Video and Signal-Based Surveillance, AVSS 2011, Klagenfurt, 30 August 2011. See the database. R. Romdhane, B. Boulay, F. Bremond and M. Thonnat. Probabilistic Recognition of Complex Event. In the 8th International Conference on Computer Vision Systems, ICVS 2011, Sophia Antipolis, France on the 20th-22nd of September 2011. G. Pusiol, F. Bremond and M. Thonnat. Unsupervised Discovery, Modeling and Analysis of long term Activities. In the 8th International Conference on Computer Vision Systems, ICVS 2011, Sophia Antipolis, France on the 20th-22nd of September 2011. P. Bilinski and F. Brémond, Evaluation of local descriptors for action recognition. In the 8th International Conference on Computer Vision Systems, ICVS 2011, Sophia Antipolis, France on the 20th-22nd of September 2011. L. Patino, M. Evans, J. Ferryman, F. Bremond and M. Thonnat. Unsupervised Activity Extraction on Long-Term Video Recordings Employing Soft Computing Relations. In the 8th International Conference on Computer Vision Systems , ICVS 2011, Sophia Antipolis, France on the 20th-22nd of September 2011. V. Martin, V. Moncada, JM. Travere, T.Loarer, F.Bremond and M.Thonnat. A Cognitive Vision System for Nuclear Fusion Device Monitoring. In the 8th International Conference on Computer Vision Systems , ICVS 2011, Sophia Antipolis, France on the 20th-22nd of September 2011. E. Corvee and F. Bremond. Haar like and LBP based features for face, head and people detection in video sequences. In the International Workshop on Behaviour Analysis, Behave 2011, Sophia Antipolis, France on the 23rd of September 2011. E. Zaidenberg, B. Boulay, C. Garate, D.P. Chau, F. Bremond and M. Thonnat. Group interaction and group tracking for video-surveillance in underground railway stations. In the International Workshop on Behaviour Analysis, Behave 2011, Sophia Antipolis, France on the 23rd of September 2011. J.L Patino, H. Benhaddha, N. Nefzi, B. Boulay, F. Bremond and M. Thonnat. Abnormal behavior detection in video protection systems. In the International Workshop on Behaviour Analysis, Behave 2011, Sophia Antipolis, France on the 23rd of September 2011. V. Joumier, R. Romdhane, F. Bremond, M. Thonnat, E. Mulin, P.H. Robert, A. Derreumeaux, J. Piano and L. Lee. Video Activity Recognition Framework for assessing motor behavioural disorders in Alzheimer Disease Patients. In the International Workshop on Behaviour Analysis, Behave 2011, Sophia Antipolis, France on the 23rd of September 2011. M. Souded, L. Giulieri and F. Bremond. An Object Tracking in Particle Filtering and Data Association Framework, Using SIFT Features. In the Imaging for Crime Detection and Prevention Conference (ICDP 2011), Kingston University, London, UK, 3rd-4th November 2011. D.P. Chau, F. Bremond and M. Thonnat. A multi-feature tracking algorithm enabling adaptation to context variations. In the Imaging for Crime Detection and Prevention Conference (ICDP 2011), Kingston University, London, UK, 3rd-4th November 2011. E. Corvee, S. Bak and F. Bremond. People detection and re-identification for multi surveillance cameras. In the International Conference on Computer Vision Theory and Applications (VISAPP), Rome Italy, 24-26 February 2012. V. Joumier, E. Mulin, J. H Lee, J. Piano, A. Derreumaux, R. David, P. Mallea, A. Dechamps, P. H Robert, R. Romdhane, M. Thonnat and F. Bremond. Measurement instrument for assessing functional	abilities of elderly people with and with- out dementia using a video monitoring system. In the 6th International Conference on Bioinformatics and Biomedical Engineering (ICBBE), pp 1-4 Shanghai, China, Mai 2012. C. Crispim-Junior, V. Joumier, Y.L. Hsu, M.C. Pai, P.C Chung, A. Dechamps, P. Robert and F. Bremond. Sensors data assessment for older person activity analysis. In the proceedings of the ISG*ISARC 2012 Conference (International Society for Gerontechnology, the 8th world conference in cooperation with the ISARC, International Symposium of Automation and Robotics in Construction), Eindhoven, The Netherlands, 26 to 29 June 2012. J. Badie, S. Bak, S. Serban and F. Bremond. Recovering people tracking errors using enhanced covariance-based signatures. PETS 2012, The Fourteenth IEEE International Workshop on Performance Evaluation of Tracking and Surveillance, part of AVSS 12, Beijing on 18 September 2012. P. Bilinski and F. Bremond. Contextual Statistics of Space-Time Ordered Features for Human Action Recognition. The 9th IEEE International Conference On Advanced Video and Signal Based Surveillance (AVSS 12), Beijing on 18-21 September 2012. S. Zaidenberg, B. Boulay and F. Bremond. A generic framework for video understanding applied to group behavior recognition. The 9th IEEE International Conference On Advanced Video and Signal Based Surveillance (AVSS 12), Beijing on 18-21 September 2012. L. Patino, F. Bremond and M. Thonnat. Online learning of activities from video. The 9th IEEE International Conference On Advanced Video and Signal Based Surveillance (AVSS 12), Beijing on 18-21 September 2012. S. Sankaranarayanan, F. Bremond and D. Tax. Qualitative Evaluation of Detection and Tracking Performance. The 9th IEEE International Conference On Advanced Video and Signal Based Surveillance (AVSS 12), Beijing on 18-21 September 2012. C. Crispim-Junior, V. Joumier and F. Bremond. A Multi-Sensor Approach for Activity Recognition in Older Patients. In the proceedings of the Second International Conference on Ambient Computing, Applications, Services and Technologies. , AMBIENT 2012. Barcelona, September 23-28, 2012. S. Bak, D.P. Chau, J. Badie, E. Corvee, F. Bremond and M. Thonnat. Multi-target tracking by discriminative analysis on Riemannian manifold. In the Proceedings of the 19th International Conference on Image Processing, IEEE Computer Society, ICIP 2012, Orlando, USA, 30 September 2012. S. Bak, G. Charpiat, E. Corvee, F. Bremond and M. Thonnat. Learning to Match Appearances by Correlations in a Covariance Metric Space. The 12th European Conference on Computer Vision. Springer, Computer Vision ~ ECCV 2012, 7574, pp. 806-820, Lecture Notes in Computer Science ~ LNCS , ECCV 2012, Firenze, Italy, October, 2012. P. Bilinski and F. Bremond. Statistics of Pairwise Cooccurring Local SpatioTemporal Features for Human Action Recognition. The 4th International Workshop on Video Event Categorization, Tagging and Retrieval (VECTaR 2012) , ECCV 2012 Workshop, Firenze, Italy, October 13, 2012. Q. MA, B. Fosty, C. Crispim-Junior and F. Bremond. Fusion Framework for Video Event Recognition. In the proceedings of the 10th IASTED International Conference on Signal Processing, Pattern Recognition and Applications , SPPRA 2013, Innsbruck. 12~14 February, 2013. M. Souded and F. Bremond. Optimized Cascade of Classifiers for People Detection Using Covariance Features. In the Int'l Conf. on Computer Vision Theory and Applications Conference, VISAPP, Barcelona, Spain, 21-24 February, 2013. P. Bilinski, E. Corvee, S. Bak and F. Bremond. Relative Dense Tracklets for Human Action Recognition . The 10th IEEE International Conference on Automatic Face and Gesture Recognition , FG 2013, Shanghai, China, 22-26 April, 2013. D.P. Chau, M. Thonnat and F. Bremond. Automatic Parameter Adaptation for Multi-Object Tracking. In the 9th International Conference on Computer Vision Systems, ICVS 2013, St. Petersburg, Russia on July 16-18, 2013. R. Romdhane, C. Crispim-Junior, F. Bremond and M. Thonnat. Activity Recognition and Uncertain Knowledge in Video Scenes. In the 10th IEEE International Conference on Advanced Video and Signal-Based Surveillance 2013, AVSS 2013, Krakow, Poland on August 27-30, 2013. D.P. Chau, J. Badie, F. Bremond and M. Thonnat. Online Tracking Parameter Adaptation based on Evaluation. In the 10th IEEE International Conference on Advanced Video and Signal-Based Surveillance 2013, AVSS 2013, Krakow, Poland on August 27-30, 2013. C. Crispim-Junior, V. Bathrinarayanan, B. Fosty, A. Konig, R. Romdhane, M. Thonnat and F. Bremond. Evaluation of a Monitoring System for Event Recognition of Older People. In the 10th IEEE International Conference on Advanced Video and Signal-Based Surveillance 2013, AVSS 2013, Krakow, Poland on August 27-30, 2013. C. Crispim-Junior, B. Fosty, R. Romdhane, F. Bremond and M. Thonnat. Combining Multiple Sensors for Event Recognition of Older People. In the 1st ACM International Workshop on Multimedia Indexing and Information Retrieval for Healthcare, MIIRH 2013, Copyright 2013 ACM 978-1-4503-2398-7/13/10, http://dx.doi.org/10.1145/2505323.2505329, Barcelona, October 22, 2013. B. Fosty, C. Crispim-Junior, J. Badie, F. Bremond and M. Thonnat. Event Recognition System for Older People Monitoring Using an RGB-D Camera. In the 2nd Workshop on Assistance and Service Robotics in a Human Environment in conjunction with IEEE/RSJ International Conference on Intelligent Robots and Systems IROS, ASROB-2013, Tokyo, November 7, 2013. S. Zaidenberg, P. Bilinski and F. Bremond. Towards Unsupervised Sudden Group Movement Discovery for Video Surveillance. In the 9th International Joint Conference on Computer Vision, Imaging and Computer Graphics Theory and Applications ~ VISAPP Lisbon, Portugal, 5-8 January 2014. C. Garate, S. Zaidenberg, J. Badie and F. Bremond. Group Tracking and Behavior Recognition in Long Video Surveillance Sequences. In the 9th International Joint Conference on Computer Vision, Imaging and Computer Graphics Theory and Applications ~ VISAPP Lisbon, Portugal, 5-8 January 2014. S. Serban, S. Mukanahallipatna, V. Bathrinarayanan, E. Corvee and F. Bremond. Towards Reliable Real-Time Person Detection. In the 9th International Joint Conference on Computer Vision, Imaging and Computer Graphics Theory and Applications ~ VISAPP Lisbon, Portugal, 5-8 January 2014. S. Mukanahallipatna Simha, D.P. Chau and F. Bremond. Feature matching using co-inertia analysis for people tracking. In the 9th International Joint Conference on Computer Vision, Imaging and Computer Graphics Theory and Applications ~ VISAPP Lisbon, Portugal, 5-8 January 2014. S. Bak, R. Kumar and F. Bremond. Brownian descriptor: a Rich Meta-Feature for Appearance Matching. The Winter Conference on Applications of Computer Vision, WACV 2014, Steamboat Springs CO, United States, 24-26th March 2014. D.P. Chau, F. Bremond, M. Thonnat and S. Bak. Automatic Tracker Selection w.r.t Object Detection Performance. In the Winter Conference on Applications of Computer Vision, WACV 2014, Steamboat Springs CO, United States, 24-26th March 2014. P. Bilinski, M. Koperski, S. Bak, and F. Bremond. Representing Visual Appearance by Video Brownian Covariance Descriptor for Human Action Recognition. In Proceedings of the 11th IEEE International Conference on Advanced Video and Signal-Based Surveillance, AVSS 2014, Seoul, Korea, 26-29 August, 2014. S. Bak, S. Zaidenberg, B. Boulay, and F. Bremond. Improving Person Re-identification by Viewpoint Cues. In Proceedings of the 11th IEEE International Conference on Advanced Video and Signal-Based Surveillance, AVSS 2014, Seoul, Korea, 26-29 August, 2014. A.T. Nghiem and F. Bremond. Background subtraction in people detection framework for RGB-D cameras. In Proceedings of the 11th IEEE International Conference on Advanced Video and Signal-Based Surveillance, AVSS 2014, Seoul, Korea, 26-29 August, 2014. J. Badie and F. Bremond. Global tracker: an online evaluation framework to improve tracking quality. In Proceedings of the 11th IEEE International Conference on Advanced Video and Signal-Based Surveillance, AVSS 2014, Seoul, Korea, 26-29 August, 2014. C. Crispim-Junior and F. Bremond. Uncertainty Modeling Framework for Constraint-based Elementary Scenario Detection in Vision System. In the First International Workshop on Computer vision + ONTology Applied Cross-disciplinary Technologies in conjunction with ECCV 2014, CONTACT-2014, Zurich, Switzerland, September 7th, 2014. M. Koperski, P. Bilinski, and F. Bremond. 3D Trajectories for Action Recognition . The 21st IEEE International Conference on Image Processing , ICIP 2014, Paris, France, 27-30 October, 2014. M.K. Phan Tran, F. Bremond and P. Robert. How to interest Seniors with Serious Games ? The 4e Journées Annuelles de la Société Française des Technologies pour l'Autonomie et de Gérontechnologie Science , In French, SFTAG 2014,	Paris, France, 24-25 November, 2014. S. Bak, F. Martins, and F. Bremond. Person re-identification by pose priors. In Proceedings of the IS&T/SPIE Electronic Imaging, at San Francisco, United States, 8-12 February, 2015. P. Chau, K. Subramanian and F. Bremond. Adaptive Intelligent Controller for Multi-Object Tracking. In Proceedings of the 10th International Conference on Computer Vision Systems (ICVS 2015) , Lecture Notes in Computer Science (LNCS), Springer Verlag, Copenhagen, Denmark, 06 - 09 July 2015. P. Bilinski and F. Bremond. Video Covariance Matrix Logarithm for Human Action Recognition in Videos. The International Joint Conference on Artificial Intelligence, IJCAI 2015, Buenos Aires, Argentina from July 25th to July 31st, 2015. L.A. Nguyen, P. Chau and F. Bremond. Robust Global Tracker based on an Online Estimation of	Tracklet Descriptor Reliability. In Proceedings of the 17th IEEE International Workshop on Performance Evaluation of Tracking and Surveillance, PETS 2015 , Part of AVSS 2015, Karlsruhe, Germany, 25 August, 2015. J. Ortiz, S. Bak, M. Koperski and F. Bremond. Minimizing hallucination in Histogram of Oriented Gradients. Poster. In Proceedings of the 12th IEEE International Conference on Advanced Video and Signal-Based Surveillance, AVSS 2015, Karlsruhe, Germany, 25-28 August, 2015. F. Negin, S. Cosar, M. Koperski, and F. Bremond. Generating Unsupervised Models for Online Long-Term Daily Living Activity Recognition. The 3rd IAPR Asian Conference on Pattern Recognition, ACPR2015, Kuala Lumpur, Malaysia, 4-6 November, 2015. M.K. Phan Tran, F. Bremond and P. Robert. Assistance for Older Adults in Serious Game using an Interactive System, The Games and Learning Alliance conference (GALA 2015), in Rome 9-11 December 2015. M.K. Phan Tran, P. Robert and F. Bremond. A virtual agent for enhancing performance and engagement of older adults with dementia in Serious Game, The 3rd Workshop Affect, Compagnons Artificiel et Interaction (WACAI 2016), in Brest, France, 13-14 june 2016. F. Negin, M. Koperski, C. Crispim-Junior, F. Bremond, S. Cosar and K. Avgerinakis. A Hybrid Framework for Online Recognition of Activities of Daily Living In Real-World Settings. In Proceedings of the 13th IEEE International Conference on Advanced Video and Signal-Based Surveillance, AVSS 2016, in Colorado Springs, Colorado, USA, 24-26 August, 2016. S. Chen, F. Bremond, H. Nguyen and H. Thomas. Exploring Depth Information for Head Detection with Depth Images. In Proceedings of the 13th IEEE International Conference on Advanced Video and Signal-Based Surveillance, AVSS 2016, in Colorado Springs, Colorado, USA, 24-26 August, 2016. C.F. Crispim-Junior, M. Koperski, S. Cosar and F. Bremond. Semi-supervised understanding of complex activities from temporal concepts. In Proceedings of the 13th IEEE International Conference on Advanced Video and Signal-Based Surveillance, AVSS 2016, in Colorado Springs, Colorado, USA, 24-26 August, 2016. T.L.A. Nguyen, F. Bremond and J. Trojanova. Multi-Object Tracking of Pedestrian Driven by Context. In Proceedings of the 13th IEEE International Conference on Advanced Video and Signal-Based Surveillance, AVSS 2016, in Colorado Springs, Colorado, USA, 24-26 August, 2016. M. Koperski and F. Bremond. Modeling Spatial Layout of Features for RealWorld Scenario RGB-D Action Recognition. In Proceedings of the 13th IEEE International Conference on Advanced Video and Signal-Based Surveillance, AVSS 2016, in Colorado Springs, Colorado, USA, 24-26 August, 2016. F. Khan and F. Bremond. Unsupervised data association for Metric Learning in the context of Multi-shot Person Re-identification. In Proceedings of the 13th IEEE International Conference on Advanced Video and Signal-Based Surveillance, AVSS 2016, in Colorado Springs, Colorado, USA, 24-26 August, 2016. P. Bilinski and F. Bremond. Human Violence Recognition and Detection in Surveillance Videos. In Proceedings of the 13th IEEE International Conference on Advanced Video and Signal-Based Surveillance, AVSS 2016, in Colorado Springs, Colorado, USA, 24-26 August, 2016. P. Bilinski, A. Dantcheva and F. Bremond. Can a smile reveal your gender? In Proceedings of the 15th International Conference of the Biometrics Special Interest Group, BIOSIG'16, Darmstadt, Germany, 21-23 September, 2016. J. Trojanova, K. Krehnac and F. Bremond. Data-Driven Motion Pattern Segmentation in a Crowded Environment. In Proceedings of the Crowd Understanding Workshop, part of the 14th European Conference on Computer Vision, ECCV 2016, Amsterdam, The Netherlands, October 10th, 2016. E. Gonzalez-Sosa, A. Dantcheva, R. Vera-Rodriguez, JL. Dugelay, F. Bremond and J. Fierrez. Image-based Gender Estimation from Body and Face across Distances. ICPR'16, in the 23rd International Conference on Pattern Recognition , Cancun, Mexico, 4-8 December, 2016. S. Baabou, A. Ben Fradj, M. Farah, F. Bremond and A. Kachouri. Hand-Crafted System for Person Re-Identification: A Comprehensive Review. In Proceedings of the International Conference on Smart, Monitored and Controlled Cities, SM2C'2017, Kerkennah Island, Sfax-Tunisia, Feb. 17-19, 2017. F.M. Khan and F. Bremond. Multi-shot Person Re-identification using Part Appearance Mixture. In Proceedings of the Winter Conference on Applications of Computer Vision, WACV 2017, Santa Rosa, CA, United States, 27-29th March 2017. S. Das, M. Koperski, F. Bremond and G. Francesca. Action Recognition based on a mixture of RGB and Depth based skeleton. In Proceedings of the 14th IEEE International Conference on Advanced Video and Signal-Based Surveillance, AVSS 2017, in Lecce, Italy, 29 August - 1st September, 2017. L.A. Nguyen, F.M. Khan, F. Negin and F. Bremond. Multi-Object tracking using Multi-Channel Part Appearance Representation. In Proceedings of the 14th IEEE International Conference on Advanced Video and Signal-Based Surveillance, AVSS 2017, in Lecce, Italy, 29 August - 1st September, 2017. A. Dantcheva, P. Bilinski, H. Nguyen, J.C. Broutart and F. Bremond. Expression Recognition for Severely Demented Patients in Music Reminiscence-Therapy. In Proceedings of the 25th European Signal Processing Conference, (EUSIPCO), Greek island of Kos from August 28 to September 2, 2017. S. Yoon, F.M. Khan and F. Bremond. Efficient Video Summarization Using Principal Person Appearance for Video-Based Person Re-Identification. In Proceedings of The British Machine Vision Conference, BMVC 2017, London, UK, 4-7th September 2017. C.F. Crispim-Junior, J. Vlasselaer, A. Dries and F. Bremond. BEHAVE - Behavioral analysis of visual events for assisted living scenarios. In Proceedings of the Fifth International Workshop on Assistive Computer Vision and Robotics (ACVR), part of ICCV, in Venice, Italie, 28 August, 2017. S. Das, M. Koperski, F. Bremond and G. Francesca. A Fusion of Appearance based CNNs and Temporal evolution of Skeleton with LSTM for Daily Living Action Recognition. In ArXiv Computer Vision and Pattern Recognition (cs.CV), arXiv:1802.00421 [cs.CV], 1st Feb 2018. R. Trichet and F. Bremond. LBP Channels for Pedestrian Detection. In Proceedings of the Winter Conference on Applications of Computer Vision, WACV 2018, Lake Tahoe, NV/CA, United States, 12-14th March 2018. S. Baabou, F.M. Khan and F. Bremond ,A. Ben Fradj, M. A. Farah, A. Kachouri. Tracklet and Signature Representation for Multi-shot Person Re-Identification. The International Multi-Conference on Systems, Signals and Devices, SSD 2018, Hammamet, Tunisia, 19-22th March 2018. P. Bilinski, A. Dantcheva and F. Bremond. Show me your face and I will tell you your height, weight and BMI. In Proceedings of the 24th International Conference on Pattern Recognition, (ICPR'18), Beijing, China, 20-24th August, 2018. Y. Wang, A. Dantcheva, J.C. Broutart, P. Robert, F. Bremond and P. Bilinski. Comparing methods for assessment of facial dynamics in patients with major neurocognitive disorders. In Proceedings of the Sixth International Workshop on Assistive Computer Vision and Robotics, ACVR 2018, part of ECCV, Germany, Munich, 9th September 2018. Y. Wang, A. Dantcheva and F. Bremond. From attribute-labels to faces: face generation using a conditional generative adversarial network. In Proceedings of the 5th Women in Computer Vision (WiCV) Workshop, in conjunction with the European Conference on Computer Vision (ECCV), Germany, Munich, 9th September 2018. A. Das, A. Dantcheva and F. Bremond. Mitigating bias in gender, age, and ethnicity: a multi-task convolution neural network approach. In Proceedings of the 1st International Workshop on Bias Estimation in Face Analysis (BEFA) in conjunction with the European Conference on Computer Vision - Winner of the ECCV Challenge on Bias Estimation in Face Analytics (BEFA) Challenge -, part of ECCV, Germany, Munich, 9th September 2018. Y. Wang, A. Dantcheva and F. Bremond. From attribute-labels to faces: text based face generation using conditional generative adversarial networks. In Proceedings of the IEEE BIOSIG 2018, Germany, Darmstadt,27-28 September, 2018. R. Trichet and F. Bremond. Cascade-Dispatched Classifier Ensemble and Regressor for Pedestrian Detection. In Proceedings of the 14th IEEE International Conference on Advanced Video and Signal-Based Surveillance, AVSS 2018, in Auckland, New Zealand, 27-30 November 2018. JD. Gonzales Zuniga, TLA. Nguyen F. Bremond. Residual Transfer Learning for Multiple Object Tracking. In Proceedings of the 14th IEEE International Conference on Advanced Video and Signal-Based Surveillance, AVSS 2018, in Auckland, New Zealand, 27-30 November 2018. F. Negin, A. Goel, A. Abdelrahman, F. Bremond and G. Francesca. Online Detection of Long-Term Daily Living Activities by Weakly Supervised Recognition of Sub-Activities. In Proceedings of the 14th IEEE International Conference on Advanced Video and Signal-Based Surveillance, AVSS 2018, in Auckland, New Zealand, 27-30 November 2018. S. Das, M. Koperski, F. Bremond and G. Francesca. Deep-Temporal LSTM for Daily Living Action Recognition. In Proceedings of the 14th IEEE International Conference on Advanced Video and Signal-Based Surveillance, AVSS 2018, in Auckland, New Zealand, 27-30 November 2018. U. Ujjwal, A. Dziri, B. Leroy and F. Bremond. Late Fusion of Multiple Convolutional Layers for Pedestrian Detection. In Proceedings of the 14th IEEE International Conference on Advanced Video and Signal-Based Surveillance, AVSS 2018, in Auckland, New Zealand, 27-30 November 2018. F. Verrini, C. Crispim-Junior, M. Chessa, F. Solari and F. Bremond. Recognition of Daily Activities by embedding hand-crafted features within a semantic analysis. In Proceedings of the Third IEEE International Conference on Image Processing, Applications and Systems, IPAS 2018, Sophia Antipolis, France, 12-14 December 2018. K. Sakhalkar and F. Bremond. Learning to Represent Spatio-Temporal Features for Fine Grained Action Recognition. In Proceedings of the Third IEEE International Conference on Image Processing, Applications and Systems, IPAS 2018, Sophia Antipolis, France, 12-14 December 2018. A. Goel, A. Abdelrahman, M. Koperski, F. Bremond and G. Francesca. Online temporal detection of daily-living human activities in long untrimmed video streams. In Proceedings of the Third IEEE International Conference on Image Processing, Applications and Systems, IPAS 2018, Sophia Antipolis, France, 12-14 December 2018. S. Das, K. Sakhalkar, M. Koperski and F. Bremond. Spatio-Temporal Grids for Daily Living Action Recognition. In Proceedings of the Indian Conference on Computer Vision, Graphics and Image Processing, ICVGIP'18, Hyderabad, India, 19-21 December 2018. F.M. Khan and F. Bremond. Cross domain Residual Transfer Learning for Person Re-identification. In Proceedings of the IEEE Winter Conference on Applications of Computer Vision, WACV 2019, Waikoloa Village, Hawaii, January 7-11, 2019. S. Das, A. Chaudhary, F. Bremond and M. Thonnat. Where to Focus on for Human Action Recognition?. In Proceedings of the IEEE Winter Conference on Applications of Computer Vision, WACV 2019, Waikoloa Village, Hawaii, January 7-11, 2019. S. Das, M. Thonnat, K. Sakhalkar, M. Koperski, F. Bremond and G. Francesca. A New Hybrid Architecture for Human Activity Recognition from RGB-D videos. In Proceedings of the 25th International Conference on MultiMedia Modeling, MMM 2019, in Thessaloniki, Greece, January 8-11, 2019. SL. Happy, A. Dantcheva, A. Das, R. Zeghari, P. Robert and F. Bremond. Characterizing the state of apathy with facial expression and motion analysis. In Proceedings of the 14th IEEE International Conference on Automatic Face and Gesture Recognition, FG'19, Lille, France,May 14-18, 2019. F. Brémond. Les attributs multivalués dans les systèmes de représentation de connaissances à objets; l'exemple du raisonnement spatial. Master's thesis, Ecole Normale Supérieure de Lyon, September 1992. F. Brémond and M. Thonnat. Interprétation de séquences d'images et incertitude . In proc. of the Rencontres sur la Logique Floue et ses Applications (LFA), Nancy (France), December 1996. F. Brémond, N. Maillot, M. Thonnat and T. Vu, Ontologies For Video Events. INRIA Research Report RR-5189, May 2004. C. Fedorczak and F. Bremond. VIDEO-ID: Identification de comportements et de personnes par la vidéo, Projet ANR-CSOSG 2007 . In the Workshop Interdisciplinaire sur la Sécurité Globale - WISG 2008, Troyes - France, Janvier 2008. J.L Patino, E. Corvee, F. Bremond and M. Thonnat. Data mining for activity extraction in video data. In the 8èmes journées francophones "Extraction et Gestion des Connaissances EGC´2008, Sophia Antipolis - France, 29 janvier au 1er février 2008. M. Carballeda and F. Bremond. VIDEO-ID, Architecture logicielle . In the Workshop Interdisciplinaire sur la Sécurité Globale - WISG 2009, Troyes - France, Janvier 2009. C. Cottez, S. Revelin, P. Paqueron, A. Woiselle, P. Bernas, E. Paul, F. Alcatrao, M. Plantive, F. Bremond, M. Moritz and A. Jammet. MOVEMENT : AutoMatic BiOmetric Verification and PersonnEl Tracking for SeaMless Airport ArEas Security MaNagemenT. In the Workshop Interdisciplinaire sur la Sécurité Globale - WISG 2015, Troyes - France, 3-4 February 2015.